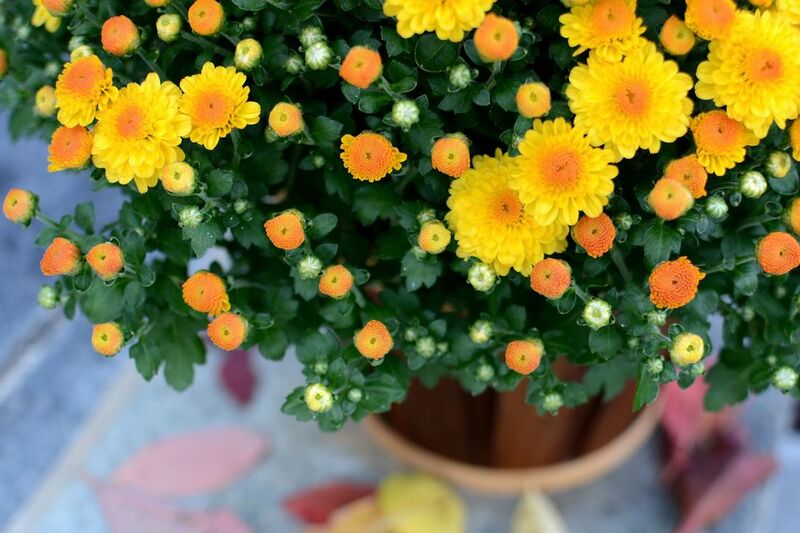 Mums are as ubiquitous as pumpkins in the fall. You can find them everywhere and anywhere from nurseries to supermarkets to gas stations. However, once you get them home they are incredibly easy to kill. They dry out in a nanosecond and need to be watered at least once a day. After the repeated stress of drying out, they often just up and die. Here are five tips to keep your mums from croaking. This is the single most important thing you can do to increase the longevity of your mums. Most mums are completely root bound when you get them. The roots have taken up the entire pot, which makes it really hard for the soil to retain any water. The best way to deal with this is to provide your mums with more soil by re-potting them. To do this, choose a container that is a little bigger than the container your mums came in. Fill the bottom of the new pot with a good quality potting soil. Carefully remove the mum from its nursery pot. Break up any roots you can, or simply rough them up by rubbing them. Put the plant in the new pot, making sure the surface of the soil rests at least an inch below the lip of the new pot, which is done so there is room for water, instead of the water running off the soil out of the pot. Fill in around the plant's root ball with the potting soil, because you want soil, not air surrounding the roots. Tamp down soil gently. Give the pot a good watering—until it flows out of the bottom of the pot. You may need to add more soil after watering the first time. Mums are sun-lovers, so make sure your pot gets at the minimum, 4 hours of direct sun a day. As the fall days are short and the sun has already moved across the horizon since the summer, you may find that the places you get the most sun have moved. Where you once had full, unobstructed sun, a tree or building may now be blocking the light. You can use a sun calculator or just try to observe how long the sun is hitting your pot. You might be surprised. Mums do not like to get dry. When their leaves are drooping, which can happen ridiculously quickly, they are way too dry. Try to water them before they get to that state. If you haven't re-potted your mum, which let's face it, lots of us (understandably) won't do, there are two ways to tell if it's dry. You can stick your finger, up to the second knuckle into the soil to see if it feels dry. However, sometimes this isn't even possible because the plant is so root-bound and the soil so hard. You can also try picking up the pot. If it's light, water and water deeply. You usually water plants until the water pours out the bottom, but with a pot bound mum, it's possible that the water will go around the roots, down the sides of the pot and out the bottom without the plant getting much water. Also, if you've let the plant dry out, the soil contracts and the same thing can happen. To avoid this, and to re-hydrate dry soil, put the mum pot in a bucket of water with a few inches of water and leave it to soak for a few hours. Don't forget it, because the plant can drown if you do. You can also fully submerge the pot in a bucket of water to re-hydrate the soil. Stick a skewer or a pencil in the soil at the top to make sure the water soaks in. Deadheading is one of those tedious garden chores that almost as soon as you finish it, you have to start over again. Tip: It's much more enjoyable to do while talking on the phone or listening to music with headphones. Deadheading mums are worth the trouble though. They will look much better when finished and chances are they will last longer! Choosing the right plant is key to having it thrive. A plant that has repeatedly dried out will be stressed and not a good candidate. If you buy a mum at a supermarket or big box store, be particularly careful because they often are under-watered. It even makes sense to ask the store what day they get their new shipments and try to buy one on the day they get there before they've had too many chances to be neglected. Look for plants where the leaves are deep green and healthy, not droopy. Find plants that have lots of buds and not too many blooms. While some people try to overwinter their mums, we've never had much luck with it. We treat them as an annual and pitch them onto the compost pile after they've been killed by frost.